QOur documents allow residents to have dogs that are under a certain weight limit. Unfortunately, we have a high number of renters who seem to flock to our building because they can bring their pets, so we want to adopt a rule prohibiting renters from having dogs. Is this legal? Is there any way that we can limit the number of dogs we have in the building or prohibit tenants from having dogs? ADepending on the language in your governing documents, you may have to keep living with the dogs unless or until your membership votes to amend. If your association’s declaration does not expressly restrict tenants from having pets, then an amendment will be necessary since a rule cannot conflict with a recorded restriction. Although the association is authorized to adopt and enforce reasonable rules and regulations governing the operation and use of the condominium property, under Florida law, in order for such rules to be valid and enforceable, the rules must not contradict a recorded restriction in the association’s governing documents. In general, provisions in the declaration take precedence over any conflicting language in the rules. While the Division of Condominiums has upheld and enforced association rules that specifically differentiate between unit owners and tenants, in such cases the declaration contained express provisions to substantiate the rule.Specifically, the Division upheld a condominium association’s rule restricting tenants from maintaining pets on the premises but allowing pet ownership by unit owners. In Grove Isle Condominium Association, Inc. v. Levy, et al, the association’s declaration provided that “[n]o pets may be kept on the condominium property except for usual and ordinary domesticated pets weighing less than 25 pounds, which may be kept by unit owners . . .” Based upon that provision, the arbitrator held that the board-adopted rule prohibiting tenants from maintaining pets was valid and consistent with the association’s declaration, which specifically granted unit owners the right to own pets, but was silent on the issue of tenants’ rights regarding pet ownership. Likewise, in the arbitration case of Quatraine Condominium II Association v. Bradley, the association’s declaration provided that original owners of the condominium were permitted to maintain pets in the condominium residences. The board adopted a rule, which provided that lessees were not allowed to have any pets. The arbitrator held that differential treatment between owners and lessees was valid. QOur condominium hasn’t enforced some of our rules in a long time. How do we start enforcing them now? AWhen an association hasn’t enforced its rules, it becomes subject to potential defenses of waiver, estoppel, and/or selective enforcement in connection with any attempts to enforce the provision in the future. However, Florida courts have held that if an association provides owners with notice of its intent to prospectively enforce the provisions of the governing documents prior to any actual enforcement of the restrictions, owners may not rely upon previously permitted violations to support defenses of selective enforcement, estoppel, or waiver. This means that selective enforcement, estoppel, or waiver defenses raised against an association attempting to enforce restrictions that had been previously ignored may not be successful to prevent enforcement where an association has adopted and implemented a uniform policy of prospective enforcement of existing rules and regulations, and has notified the unit owners of that new policy. This is commonly known as “grandfathering.” In such event, owners are placed on specific notice that current, registered violations will be accepted or “grandfathered” and any subsequent violation of the restrictions will not be permitted. QWe have some owners that want to swap their parking spaces with other owners. Is this allowed? AThe assignment and transfer of parking spaces for units is governed by the association’s governing documents and Chapter 718, Florida Statutes. In connection with the transfer of use rights for limited common elements, Section 718.106(2), Florida Statutes, provides that the right of a unit owner to transfer the use rights of a limited common element to other units or unit owners exists to the extent authorized by an association’s declaration as originally recorded or any amendments thereto. or swap their parking spaces, then owners may not do so. QWe are a no-pet building. However, we have been receiving more and more requests from residents asking to keep “comfort animals.” What are our rights as a board to enforce our no-pet restriction? ABefore denying a resident’s request for an emotional support animal, you need to be aware that there are state and federal statutory provisions that address a housing provider’s obligation to provide reasonable accommodations to handicapped individuals. Specifically, the Fair Housing Amendments Act and the Florida Fair Housing Amendments Act both provide that an association is required to make reasonable accommodations for the handicapped in rules, policies, practices, or services when such accommodations are necessary “to afford equal opportunity to use and enjoy a dwelling.” The failure to make an accommodation could result in a discrimination complaint being filed against the association. In order to prevail on Fair Housing discrimination claim, a plaintiff must establish that (1) he is disabled or handicapped within the meaning of the FHA, (2) he requested a reasonable accommodation, (3) such accommodation was necessary to afford him an opportunity to use and enjoy his dwelling, and (4) the association refused to make the requested accommodation. It is important to note that such impairment must substantially limit one or more of the resident’s major life activities and just because we may not be able to “see” the disability, the resident may still be disabled as that term is defined under the FHA. Case law has provided that associations are able to ask certain questions in connection with the necessity of an accommodation request. 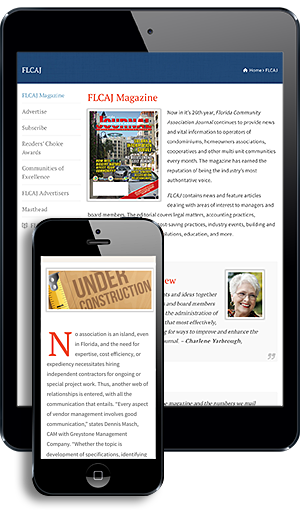 FCAP (Florida Community Association Professionals) is a member-based, professional organization dedicated to training, equipping, and advocating for Florida community association professionals including managers, service providers, and community volunteer leaders.